This has been my make-up 'table' for a while now. Think it looks cool? Organised? 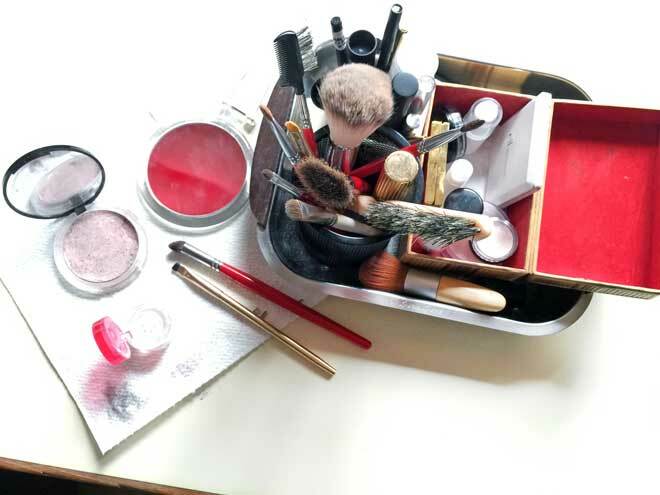 Brushes, eye shadow, blush, lipstick and other items normally arranged on a table/shelf/horizontal surface have all been stacked into a vintage stainless steel food tray. Why a food tray? It was about as close as I could get while looking for a suitable sized container that would allow me to transport from cupboard to desk (or wherever the light happens to be suitable for applying a face). I've been living in 'temporary conditions' for what seems like forever, but there is an end in sight. A brand new moving day for lab, office and home is fast approaching. Meantime, lots of notes and ideas on what kind of make-up to make as soon I have a proper work space are filling up my notebook. And there are quite a few by now. And many of them have to do with portability and ease of use. Meantime - thanks for your patience while I pack and unpack and arrange and rearrange a brand new work temporary space. Are we a little excited? Absolutely!